I am very fortunate that Foodbuzz agreed to include my reunion dinner as part of their January “24 Meals, 24 Hours, 24 Blogs” event. This event was scheduled for Saturday January 24th evening. Although tradition dictates that the reunion dinner is served on New Year’s Eve, I invited my family to join us in this celebration one day early to coincide with the Foodbuzz event. In China, and in many other parts of Asia, hot pot is a very popular way for family to share a meal around a dinner table. Similar to a fondue concept, raw or partially cooked ingredients are cut up and brought to the dining table, then cooked in a boiling broth. A pot specially designed with a flue and commonly fueled with flaming charcoal is set in the middle of the table. Before central heating was widespread in China the heat from the pot can always be counted on to warm the family at dinnertime. 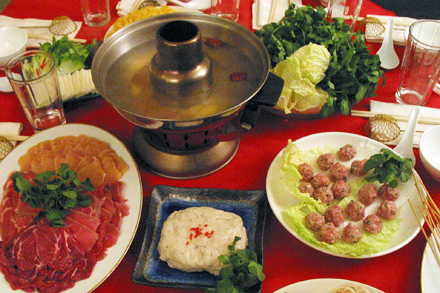 As with many other food traditions there are wide-ranging regional variations of hot pot meal. 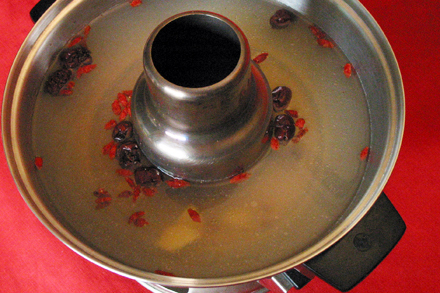 In the north “Lamb Hot Pot” (涮羊肉) is very popular, whereas in Sichuan the “Mala Hot Pot” (麻辣火鍋) is omnipresent. I decided to make the version from my family’s home province in China’s southern coastal region. It is served with a simple aromatic broth accompanied by a multitude of sliced meat, meatballs, dumplings, and vegetables. Under normal circumstances I would go to Chinatown and purchase most of the ingredients. The dumplings, meatballs and fish balls are available ready-made in the markets. But this is not an ordinary dinner. So I decided to make them all at home. As I planned the menu I divided it into fresh meat, fresh seafood, home processed meats, dumplings, soy-based ingredients and vegetables. The fresh sliced meat and cut up seafood, along with the tofu and vegetable groups can be prepared on the day of the dinner. But the processed meats, which included meatballs, fish balls and shrimp paste, and the dumplings, have to be made ahead. So over two days I premade these hot pot ingredients. For the meats I served chicken, beef and lamb. They all had to be sliced as thinly as possible so they would cook very quickly in the broth. A meat slicer would have been the best way to accomplish this. But without one I sliced them by hand using the technique of semi-freezing the meats. I froze the meats completely, then thawed them in the refrigeration compartment for 24 hours. By that time the meats were soft enough for me to cut into very thin slices. 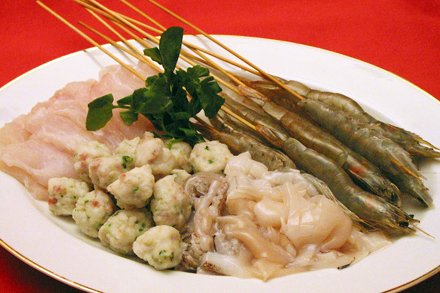 The seafood platter included slices of sea bass, squid, whole shrimps and fish balls. The squid and sea bass were sliced into bite size pieces. The shrimp were served whole and skewered for easy handling. The heads were left on to ensure freshness. For variety I made pork meatballs with water chestnuts and shiitake mushroom, fish balls with ham and scallion, and shrimp paste. 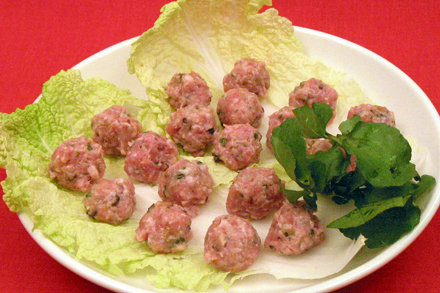 This pork meatball is typical of southern Chinese cooking. I remember growing up at home eating these pork meatballs in soups. 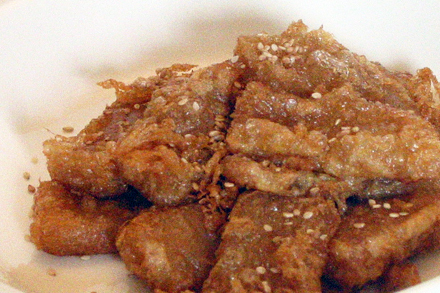 The shrimp paste is normally used for stuffing or made into balls. But I served it as paste and dropped lumps of it into the hot broth. For my family it was novel to see irregular lumps of pink shrimp paste floating in the broth. 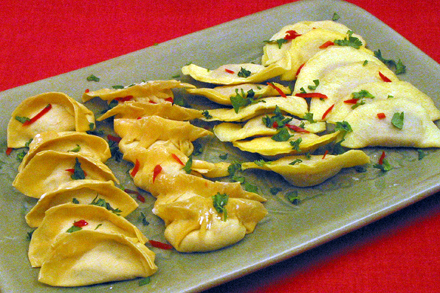 In Taiwan egg dumplings are very popular for Chinese New Year celebrations. The shape of these dumplings remind some people of gold nuggets so they have become a symbol of prosperity. I made these dumplings with succulent pork and scallion filling wrapped in an egg-based skin. I also made shrimp dumplings wrapped in wonton skins. I used part of the shrimp paste for the filling. I assembled a platter of soy-based ingredients with quail eggs. 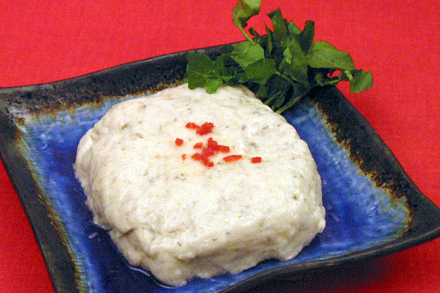 The soy ingredients included fresh and frozen tofu, and tofu skin. 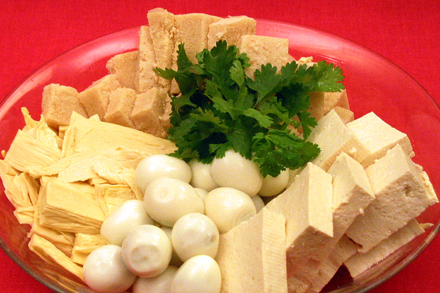 This combination highlights the different textures of tofu products. 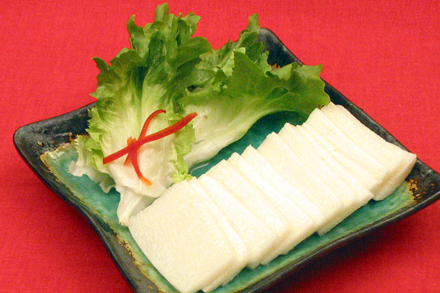 The frozen tofu had a spongy texture that contrasted with the silky smooth feel of the fresh tofu. 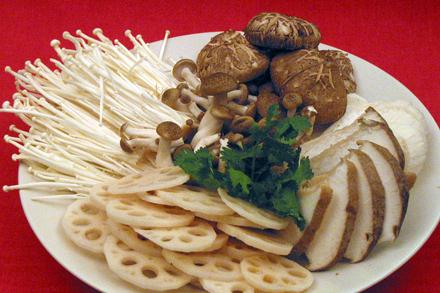 The mushroom platter combined four different kinds of mushrooms: abalone mushrooms, enoki mushrooms, beech mushrooms and shiitake mushrooms. They all had slightly different textures and flavors. They also infused incredible earthiness to the broth. 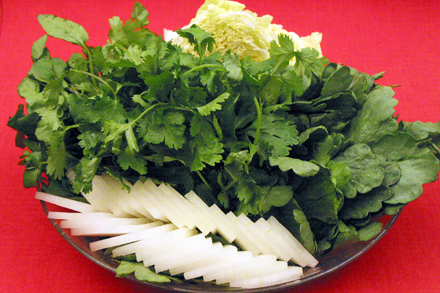 One of my favorite vegetables is chrysanthemum greens (蓬蒿) and it has always been part of our family hot pot meals. This vegetable has a slight mustard taste yet is not spicy, and compliments meat flavors very well. I combined it with napa cabbage, water crests, winter melon and cilantro. I also served Chinese yam (山藥), which is a long tuber that is very slimy when cut. It retains its crunchy texture when cooked al dente. 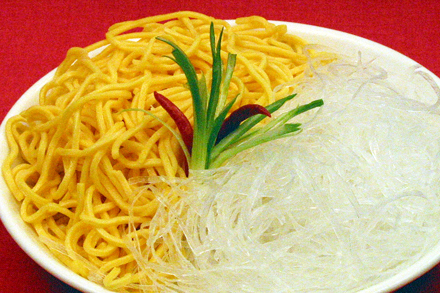 For starch ingredients I decided to put together what I called my “Gold and Silver Noodles Platter.” It was a combination of egg noodles and mung bean cellophane noodles. To spice up the flavor of the ingredients different sauces were offered. I presented a selection of eight choices for our guests to combine in any proportion they desired. To me this is part of the fun of a hot pot meal. I like to make different combinations and create original taste sensations. For this dinner I included sesame paste, peanut paste, chili oil, sesame oil, soy sauce, fried minced garlic, sliced scallion and chopped cilantro. 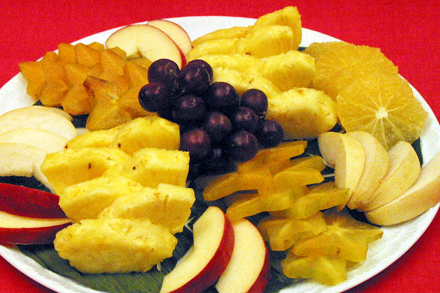 Finally I served a fresh fruit platter along with my homemade New Year cake. I deep-fried pieces of the cake in a light egg batter before serving. I was pleasantly surprised when everyone really enjoyed this cake. Perhaps one of the reasons was because it was not as sweet as the store bought version. The entire plate of cakes was devoured even before I served a new pot of hot tea. As is the practice of our family back in Asia for a hot pot meal ice-cold beer was served. Somehow the cool beer worked really well with the many different flavors of the ingredients. It is just easier to down a few bottles of beer instead of having to pair sophisticated wine. I haven’t served a hot pot meal for a while and I’ve forgotten how delicious it can be, as well as how much fun it is to prepare and eat. Besides no one really missed the red cooked pork anyway. Happy new year of the ox! Wow! My hotpot for 2 pales in comparison! 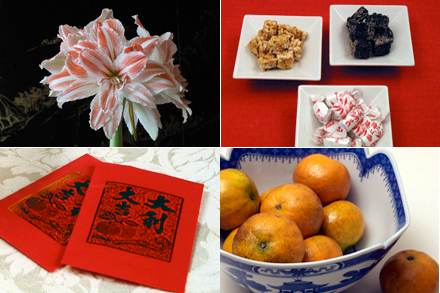 Looks like it was a fantastic meal – Happy Chinese New Year! Wow, just incredible. So impressive. What a wonderful feast! 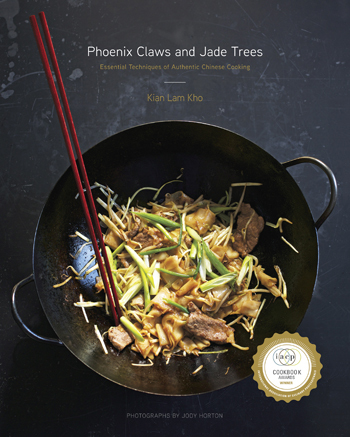 Happy New Year, Kian – and keep sharing all these magical delights. I have always wanted to do this but always seemed a bit overwhelmed at how to go about it. This definately takes the fear out of it for me. I’d love your recipes. What did you have in the hotpot? Was it a broth with chilies? Danielle, The broth is a simple aromatic chicken stock with ginger, jujube, goji berries and dried shiitake mushrooms. No chili. I will be posting recipes for the items served at this dinner in a few days. Wow. Just wow. What a fabulous feast! Love the tip about skewering the fresh shrimp. Beautiful and magnificent. I would have loved to been in attendance… wow, what a feast! What an excellent feast! Your list of fixings is so comprehensive. You don’t often see chrysanthemum greens nowadays, but I do love the flavor. I like the idea of skewering the prawns. I also like that you made your own fishballs and shrimp paste. Awesome. We also did a 24, 24, 24 CNY hot pot, only we gave it a San Francisco Bay Area twist by doing it cioppino style instead of Chinese style. Came out pretty tasty! Kian everything looks fantastic! Happy New Year! Kian, what cut of pork and chicken did you use? 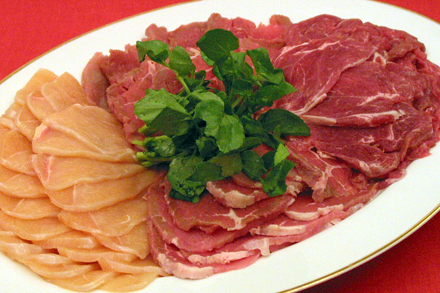 I usually use the frozen pre-sliced meats at the Chinese markets, but I would love to use fresh meat. I’m not sure which cut to order – please also let me know the chinese name as well. Thanks for sharing! Happy Cow Year! If I hadn’t been eating/writing my own 24x24x24 post, I would have begged for an invite! This meal looks absolutely decadent and enticing! Ana, I like round roast for beef. Although many people would suggest tenderloin or sirloin. For chicken I like to use boneless, skinless breast meat. Slice them all very thin to cook quickly in the broth. The Chinese terms for the loin cuts are 里脊 (tenderloin) and 外脊 (sirloin). Happy 牛(niu) year! What a fabulous CNY Eve feast! I don’t usually go for hotpot, but when I do have it, I always wonder why we don’t often do hotpot. Wow, the cooking method of this Hot Pot is great, I’ll try it later and I hope it tastes the way it look. Thanks for sharing! How to make the main Hot Pot Mix, I live in China (Shenzhen) and its easy to buy the mix, but how to make a fresh base from a non mix? There is so many different hot pot. I live in Chengdu for 7 months, travel to China for 10 years and live in China over 8 years, they have hot pot in stone pot, regular hotpot, hotpot but with raw things on a stick, pay by stick, and cold hot pot each thing is on a stick and pay per stick, also non spicy hot pot that never boil with no oil. Its easy to buy the mix at the local supermarket in China. How to make it from scratch? both Spicy and non spicy. Please english and chinese names so can get easy, I dont know any Chinese. Sorry I know its bad, but still dont know any Chinese other than very simple Chinese. David, The variety of hot pot in China is tremendous. 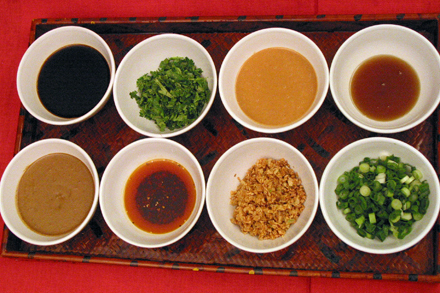 It is almost impossible to describe how to make all the different types of soup stock. But for a basic stock you can always start with chicken stock, some ginger, a couple of jujubes, and a small handful of goji berries. After that you can let your imagination run wild. Of course there’s the spicy Sichuan style stock. That is more complicated and I’ll try to blog about that soon. what an amazing spread! these days, my parents use a simple divided pot over a butane powered burner. I remember growing up with the traditional hot pot that held a live charcoal fire underneath. It was always such fun.